Just like the car battery, an oil filter is an essential part of your vehicle’s system, and helps to keep it running in peak condition. Because they are subject to wear, oil filters need to be replaced from time to time. Most vehicle experts recommend changing your oil filter whenever you have an oil change, or about every 3-6 months. Finding the best oil filter for your vehicle reading reviews, studying product features, and diving into the ins and outs of available styles and configurations. With the right oil filter, keeping your vehicle running in top condition can become a quick, over-and-done with task. We reviewed dozens of oil filters to identify the best of the best, based on Amazon reviews, how well they performed in tests, cost, and other considerations. We narrowed our search down to 5 of the top-rated oil filters vehicle owners can purchase to ensure a smooth running ride. Helps protect against engine wear by screening out abrasives. We’ve identified the Motorcraft FL-500S Oil Filter as the best oil filter out there. With a highly efficient filter media this oil filter is one that will keep your vehicle running in tip top shape. These benefits allow you to drive without worrying if your oil is causing damage to your engine. 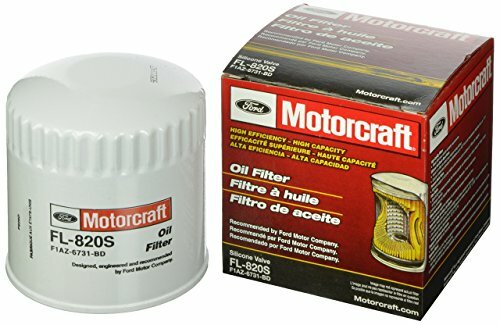 The Motorcraft FL-500S Oil Filter took the top spot on our list of the best oil filters thanks in large part to its highly efficient filter media that helps to protect against engine wear by screening out abrasives such as carbon, sand, dust, and bits of metal. Its pressure release valves help to maintain the supply of oil to the engine under extreme cold conditions, and minimizes the chance of contaminated oil making its way back into the system. Those who purchased and reviewed this oil filter appreciated that it offered tremendous value for the price, and that it was a factory recommended replacement part. A few comments mentioned engines run quieter with use, and people liked that it was compatible with both conventional and synthetic oils. With a price tag of around $6, it’s a surprisingly affordable choice, and the quality craftsmanship associated with the brand, as well as the ease of setup and use more than justifies that price. It has a rating of 4.8 on Amazon with nearly 300 people reviewing it, which we think goes a long way in convincing vehicle owners to make the investment. Strong steel base plates and housings prevent warpage, leaks, and poor fit. The Bosch 3330 Premium FILTECH Oil Filter took the runner-up spot on our list of the best oil filters, and uses the brand’s exclusive FILTECH media technology in order to help screen out more harmful contaminants for greater engine protection. It boasts strong steel base plates and housings, and comes complete with a silicone anti-drainback valve. Those who purchased and reviewed this oil filter appreciated that it was easy to install and offered an excellent fit. Many users said that it could hold a lot of contaminants, and found their oil stayed noticeably cleaner with regular use. A few reviews mentioned that the anti-drain back valve meant there were no issues with cold starts. At a cost of about $7, it’s pretty affordable as far as oil filters go, and the quality craftsmanship associated with the brand, as well as the ease of setup and use more than justifies that price. It has a rating of 4.5 on Amazon with more than 400 people reviewing it, which we think goes a long way in convincing vehicle owners to make the investment. A budget-friendly option with a sleek and simple design. The Motorcraft FL-820-S Oil Filter is an excellent choice for those looking for an oil filter option that won’t break the bank. It comes complete with silicone pressure-relief valves to help maintain the supply of oil in extreme conditions, and prevents contaminated oil from recirculating. The filter media is highly efficient at collecting and trapping dirt and other engine-harming particles. Those who purchased and reviewed this oil filter appreciated that it was easy to use and install, and helped to prevent dry starts. People also really liked the added protection of the silicone anti drain back valves. Nearly everyone who reviewed this filter said it offered excellent value for the price, especially considering it was recommended by their vehicle manufacturer. At a cost of approximately of $4, this oil filter is a solid choice for those looking for an oil filter option on a budget. It has a rating of 4.7 on Amazon with more than 700 people reviewing it, which we think goes a long way in convincing vehicle owners that this budget-friendly pick is just as good at keeping their ride running smoothly as its more expensive counterparts. For consumers looking to get the most out of their investment in full synthetic oil. 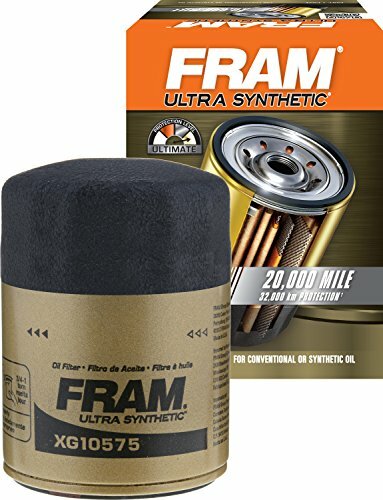 The FRAM XG10575 Ultra Synthetic Spin-On Oil Filter with SureGrip boasts a greater than 99% multi-pass filtering efficiency at >20 microns in order to provide excellent oil filtering capabilities under any driving conditions. It offers extended protection for up to 20,000 miles of use, and features a dual layered, synthetic media that has been reinforced with metal screen traps in order to help extend the life of the filter. Those who purchased and reviewed this oil filter appreciated that it was well-made and included an interior baffle to help prevent oil from flowing out when the engine is shut off. Users found their oil was noticeably cleaner with regular use. At a cost of about $11, it doesn’t come cheap, but the quality craftsmanship associated with the brand, as well as the ease of setup and use more than justifies that price. It has a rating of 4.4 on Amazon with more than 100 people reviewing it, which we think goes a long way in convincing vehicle owners to make the investment. Heavy duty construction suitable for use in extreme conditions. 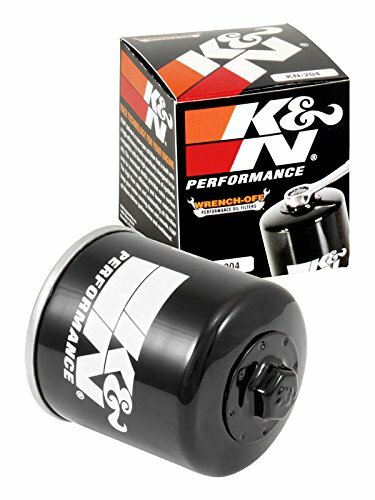 The K&N KN-204 Motorcycle/Powersports High Performance Oil Filter comes complete with a 17mm exposed nut which has been designed for easy oil filter removal, and boasts a heavy duty construction that is suitable for use in even extreme conditions. The resin-impregnated filter media helps to trap 99% of harmful contaminants for a smoother-running ride. It has been specifically designed for use with motorcycles and other powersport engines. Those who purchased and reviewed this oil filter appreciated that it could be used with both conventional and synthetic oils, and provided a high oil flow rate. People also commented that the bolt on the head of the filter made changes a breeze, and felt it was made of high quality materials. With a price tag of around $12, it doesn’t come cheap, but the quality craftsmanship associated with the brand, as well as the ease of setup and use more than justifies that price. It has a rating of 4.5 on Amazon with more than 1,100 people reviewing it, which we think goes a long way in convincing vehicle owners to make the investment. An oil filter is an essential item for any vehicle owner. Just like other components of your vehicle’s system, such as spark plugs, belts, and batteries, oil filters need to be replaced from time to time in order to keep your vehicle running in peak and safe condition. Many oil filters can provide up to 10,000 miles of use, with some models providing up to 20,000 miles of protection. Keep in mind that the type of oil you use will impact the life of the filter as well. Conventional oils will require more frequent changes, whereas full synthetics need less frequent changing. That said, it is best to replace your oil filter when you do an oil change in order to keep your vehicle running smoothly. Your vehicle’s manufacturer may have a recommended schedule for this sort of maintenance, and it’s always best to follow their suggested service timelines. Type. Arguably the most important consideration when it comes to choosing the best oil filter is the type of oil filter required. There are six main types of oil filters, including: magnetic, mechanical, cartridge and spin-on, centrifugal, sedimentation, and HE or high efficiency. Magnetic oil filters use a magnet or electromagnet in order to suspend ferromagnetic particles from the engine oil’s flow. They are super easy to clean. Mechanical oil filters use a filtering media to suspend contaminants within the oil. As contaminants build, flow is restricted, and the filter or medium will need replaced. Cartridge and spin-on oil filters feature a self-contained housing and component that can be replaced. They are quick and easy to change, and come in a variety of designs and materials. Centrifugal oil filters use centrifugal force in order to remove and filter contaminants from oil flow. Their housings need cleaned regularly to prevent buildup and engine damage. Sedimentation oil filters are sometimes called a gravity bed oil filter, and filters contaminants that are heavier than the engine oil to the bottom of the container using gravity. High efficiency oil filters allow for longer oil drain intervals thanks to their microscopic pores. Size. The next most important consideration when it comes to choosing an oil filter is the size. If you choose an oil filter that is the wrong size for your vehicle it won’t fit or filter correctly, and will eventually leak. Refer to your owner’s manual for the correct size filter for your vehicle. Filter medium. Different filter media perform differently. There are some made of cellulose, and some made of synthetic fibers. Checking an oil filter’s multi-pass filtering efficiency will give you an idea of how effective it is at removing contaminants. End caps. 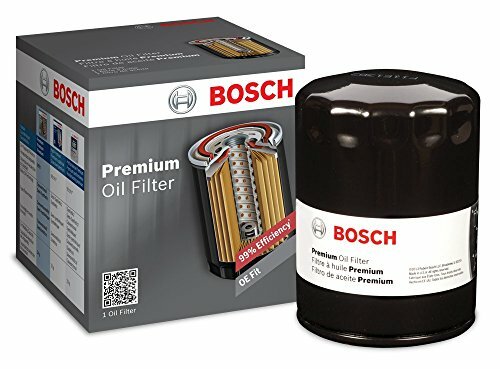 Higher end oil filters will have metal end caps for improved performance and longevity, while less expensive models often use cardboard end caps. Price point. Finally, consider how much you are willing to spend on an oil filter. Oil filters vary in price from $5-$25 or more. What is an oil filter and how does it work? An oil filter is a crucial component of your vehicle’s lubrication system, and works by removing debris, particles of metal, and other contaminants that get picked up as oil makes its way through your engine. Are oil filters all the same? Not all oil filter are the same. There are oil filters that have been specially designed for use with different types of oil. Some are suitable for conventional oil, some for semi-synthetic, and others that are best suited for use with full synthetic oils. Oil filters will also vary depending on the filter material used, with some using cellulose, while others use synthetic fibers, or a combination of the two. Oil filters also vary by size to fit various makes and models of vehicles, which is why it’s important to read and follow your owner’s manual recommendations for replacement components. Do you need a special filter for synthetic oil? You don’t need a special filter for synthetic oil, but you should always read the package to ensure that the oil filter you are considering is compatible with synthetic oils. Synthetic oil filters are called such simply because they use synthetic fibers in their filter media, not because they are only compatible with synthetic oils. That said, the quality of the oil filter you choose can have an impact on the life and longevity of the oil you use, so it’s worth doing your research and investing wisely. How do I know which oil filter is best for my car? The easiest way to tell which oil filter is best for your car is by reading the owner’s manual. You will need to determine the type and size of oil filter required before you can replace the oil filter in your car. Alternatively, if you’d rather not DIY your vehicle maintenance, a qualified mechanic can always tell you which oil filter is best for your car. We looked at 20 other oil filters. Even though they didn’t make our 5 best oil filters list, they’re the best of the rest and each is still a great option for your vehicle. The information you’ll need to compare each one is included with the listing. This standard oil filter boasts 98% multi-pass filtering efficiency at 25-30 microns in order to provide excellent filtering capabilities under any driving conditions. This standard oil filter boasts a metal-free design that uses a highly efficient filter media in order to offer high filtration efficiency at an affordable price point. This standard oil filter boasts a spin-on design that makes it easy to swap, and is suitable for use with all 2001-2018 GM trucks equipped with Allison transmissions. This standard oil filter boasts an increased dirt-holding capacity for added longevity, and comes complete with a gasket, mounting plate, center tube, and inner element tube. This standard oil filter boasts a high capacity medium that offers increased dirt-collecting capability, and has been engineered to ensure the right oil flow your vehicle requires. 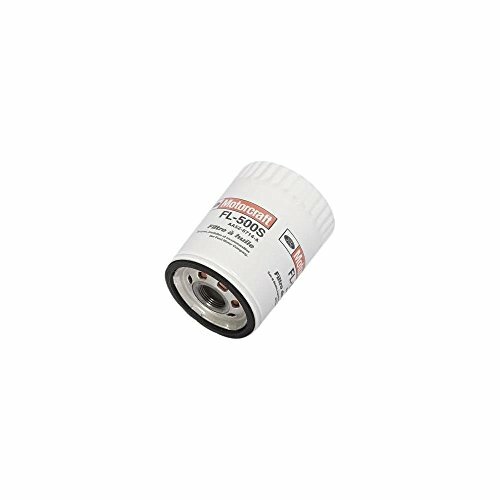 This standard oil filter boasts a unique design that simply swaps out the filter element for reduced disposal costs, and has been designed with thermoplastic end discs that are constructed of 100% recycled material. This standard oil filter has been manufactured to OEM standards in order to meet expectations for fit, form, and function, and helps cleanse oil to reduce wear on the engine’s internal components. This standard oil filter boasts an extended life filtration media which has been engineered to deliver extended miles of engine protection, and is compatible with a variety of vehicle makes and models. This standard oil filter boasts an efficient filter media that provides increased dirt-collecting capability to help protect against engine wear, and includes an anti-drain back valve. This synthetic oil filter boasts a spin-on design for quick and convenient changes, and offers extended protection up to 20,000 miles. This synthetic oil filter boasts extended protection up to 10,000 miles and uses a high-density synthetic blend media in order to provide 99% dirt removal power. This synthetic oil filter boasts extended protection up to 20,000 miles, and provides 99% multi-pass filtering efficiency at >20 microns. This synthetic oil filter boasts two times the filtration capacity of conventional oil filters, and has been proven to provide up to 10,000 miles of protection between oil changes. This synthetic oil filter boasts protection up to 10,000 miles, and provides 99% multi-pass filtering efficiency. It can also be used with conventional oils for increased versatility. This high-performance oil filter boasts extended protection up to 20,000 miles, and provides 99.6% multi-pass filtering efficiency thanks to its advanced synthetic fiber blend media. This high-performance oil filter boasts a heavy gauge steel back plate and shell to provide higher burst strength, and features 100% screen-back synthetic media for superior filtration. This high-performance oil filter boasts 99% multi-pass filtering efficiency thanks to its advanced synthetic fiber media. It offers 300% greater capacity than other oil filters for a longer life. This high-performance oil filter boasts a mixed-fiber filter media and long-life seal to provide vehicles with up to 10,000 miles of protection. Its spin-on design makes installation a breeze. Caitlin is a freelance lifestyle writer and a frequent contributor at Motor Day. She is based in the great white north in friendly Toronto, Canada. Since she got her first car, she’s loved the feel of the open road underneath her and the views through her windshield. She prides herself on being the only woman in her circle who can drive a stick shift, and is learning how to do her own vehicle maintenance.